A sight to see in itself, Changi Airport has been voted the number one airport in the world four years in a row. It offers up amazing duty-free shopping, a Butterfly Garden and a Sunflower Garden. The public transport system in the city is one of the best in the world and VERY affordable. 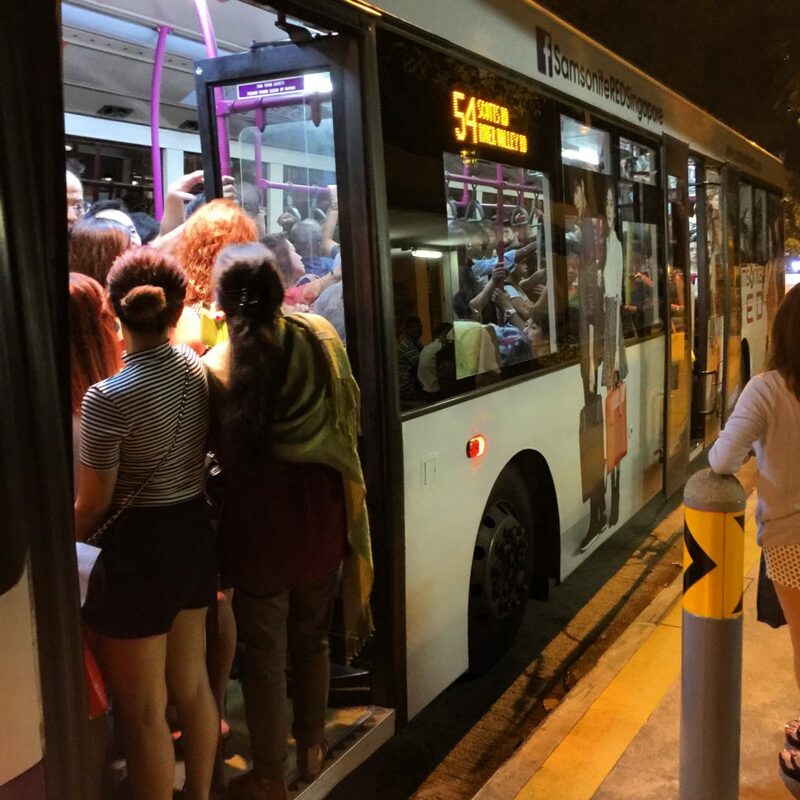 Note that the photo above does not depict a normal bus ride in Singapore, this pic is from when the subway system shut down and everyone was scrambling to get on the busses! Taxi/Uber/Grabtaxi/ComfortDelGrado: Taxis are super cheap and available everywhere. Unless you pre-load your credit card information in the app, you’ll only be able to pay with cash or local debit card (called NETS). It can be difficult at times to hail one, especially on main streets/crowded areas, so try to find a taxi stand instead. Bus: The bus system is very easy to Navigate…be sure to download the ‘City Mapper’ app, which will tell you what bus to get on/cost/etc., when you enter your destination. This app also works for the MRT. You’ll need to go to a subway to get a card/add money to it. MRT: The subway system is easy to navigate, timely, clean and inexpensive. To be more cost affective, you’ll need to purchase a MRT card from the teller at the gentry booth. You can purchase individual trip tickets from the kiosk, but it’s more time consuming and costly (unless you’re only planning to ride one or two times on the MRT). 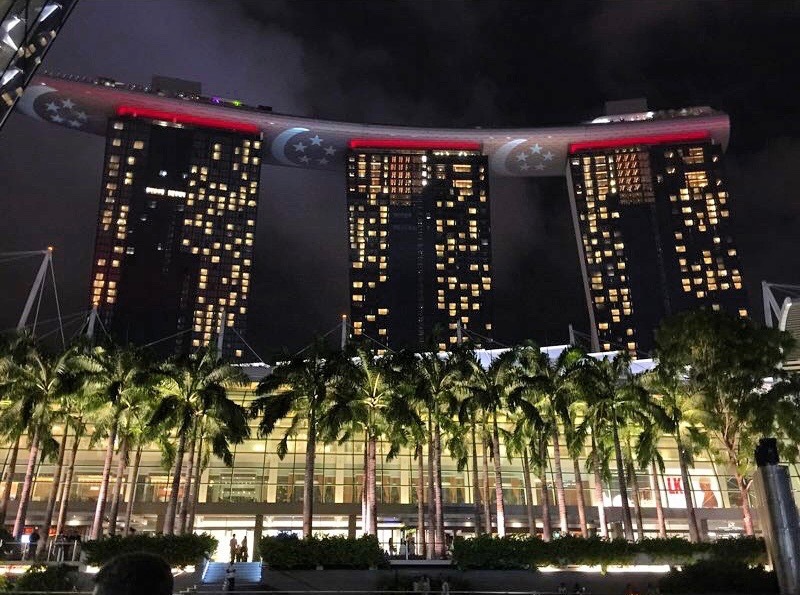 There is no shortage of places to stay and the great Lion City offers up some of the most architecturally eye catching accommodation on the planet! The iconic rooftop pool at the Marina Bay Sands is an attraction in itself. You’ll want to spend an entire day just at the pool (if time and budget permit). You’ll have two options for rooms: city view and garden view (go with the city view). The standard room rate starts around $500USD+/night. The Raffles Hotel is pure classic Singapore luxury. The Raffles Hotel was established in 1887 and named after the founder of Singapore, this colonial-style luxury hotel doesn’t disappoint. 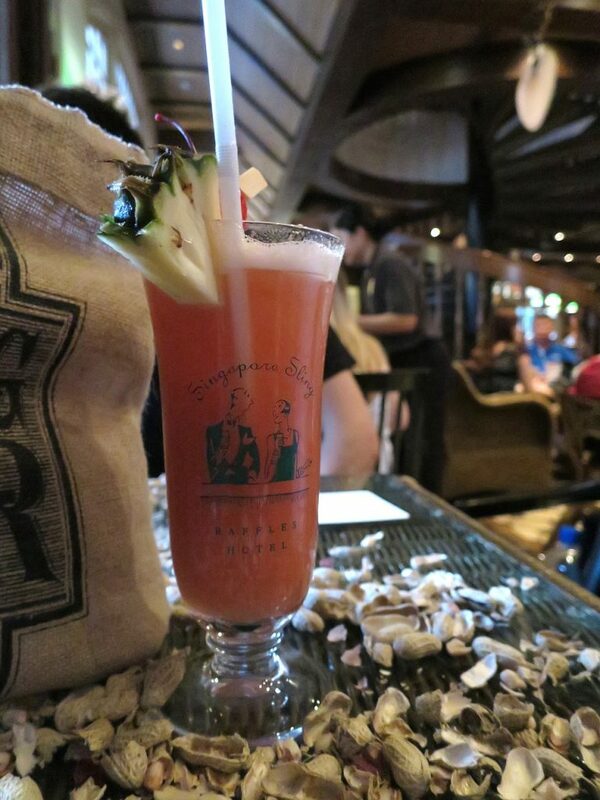 Even if you don’t stay here, be sure to go inside for a the iconic drink: Singapore Sling! Rooms start at $450USD+/night. 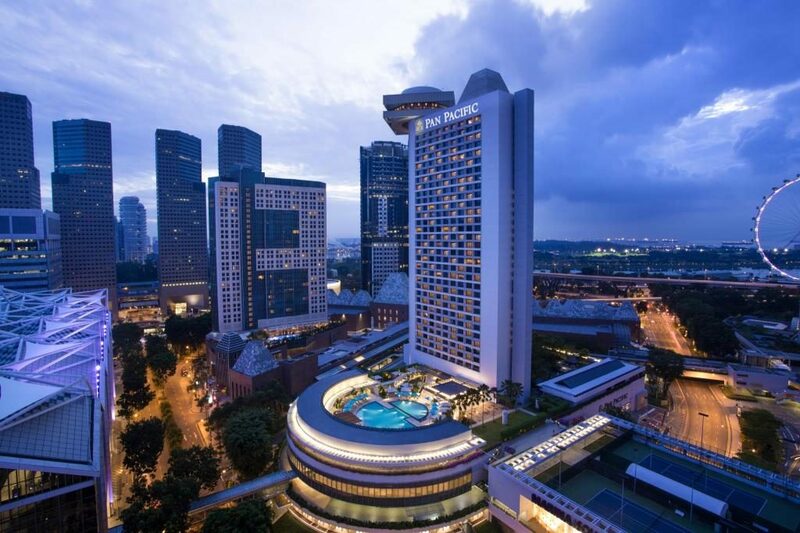 ThePan Pacific Hotel is in a great location, Marina Centre. Rates are around $180+USD/night. Try their Sunday brunch at Edge, it’s awesome! Airbnb IS NOT permitted in the country, so I wouldn’t advise going that route, although you’ll find some listings. There are many hostels available and, since Singapore is super safe, you don’t have to worry. TripAdvisor is always my go-to for accommodation! You totally must take a ride on the River Cruise while visiting the city. You’ll get the BEST views of Marina Bay and the Singapore River from the boat. TIP: Get on at Clark Quay and go through Robertson Quay, get off in front of Raffles Hotel and go inside for a Singapore Sling. Cost is $3SG per trip and you can get on/off at any of the different locations that it departs from. 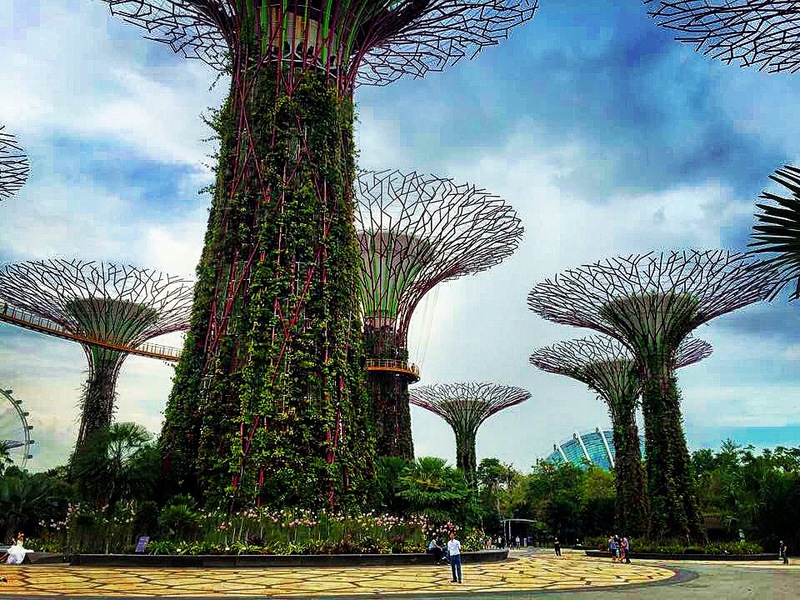 The iconic Super Trees at Gardens By The Bay are 80-150ft tall trees that are connected by a skyway bridge (be sure to go on the bridge for an extra $3SGD!). They’re a sight to see by day and night. Gardens by the Bay also offers an epic Flower Dome and Cloud Forest, which aren’t at the top of our ‘Must See’ list (unless you love flowers, then it’s a must!). If you happy to be visiting during Christmas time, be sure to go at night when it’s all lit up for Christmas Wonderland…a beautiful sight to see! Cost for entry to the Super Trees is free, but to the Flower Dome and Cloud Forest is $28. Do note there’s also a restaurant at the top of the Super Trees,called IndoChine, and though we’ve never eaten there we heard great things, although it’s overpriced. Macritchie Reservoir was one of my favorite places to run daily when we lived in Singapore. 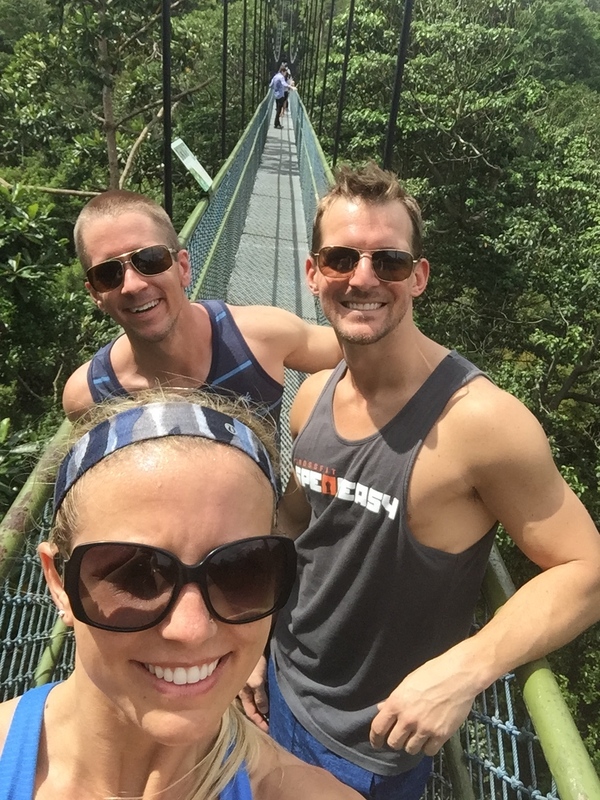 The Tree Top Suspension Bridge is such a fun hike to get to because the trails are covered in monkeys! We always took each out-of-town guest on this hike to get the true experience of Singapore’s lush reservoirs. Entry is free. Note: DO NOT feed the monkeys, it’s a big no-no. Wear comfortable shoes, bring water and mosquito repellant. How To Get There: Take a taxi to Venus Drive off upper Thomson Road. This is the starting point for the walk and the route is clearly marked at the end of the car park on Venus Drive. 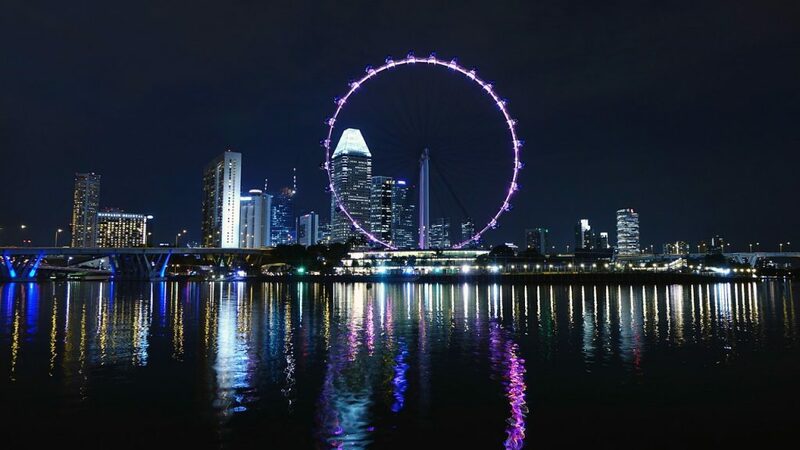 The iconic Singapore Flyer is a must see by day and night! The Singapore Flyer is the world’s largest Ferris wheel is something you cannot miss! If you can time it right, go at sunset and see the city light up while riding! Cost for entry is $33SGD, for one spin around the wheel, which takes 45-minutes. 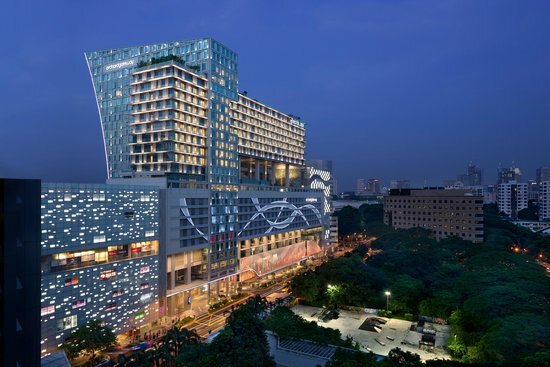 Shop it up on Orchard Road! 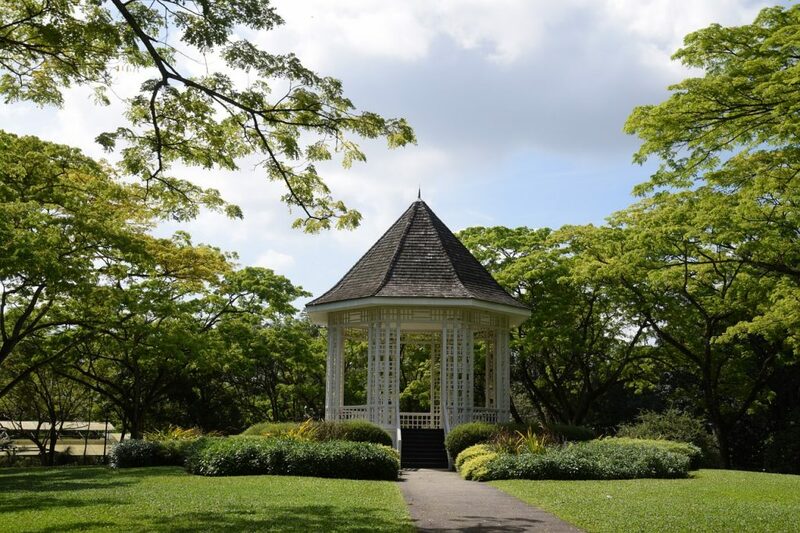 The ‘Central Park’ of Singapore, Singapore’s Botanic Gardens are a 156-year-old tropical garden located in the central area of Singapore. It is a UNESCO World Heritage Sight. Haji Lane in Little India is a little, colorful street that has boutique shopping, great restaurants and coffee shops. All things fun are in Chinatown! 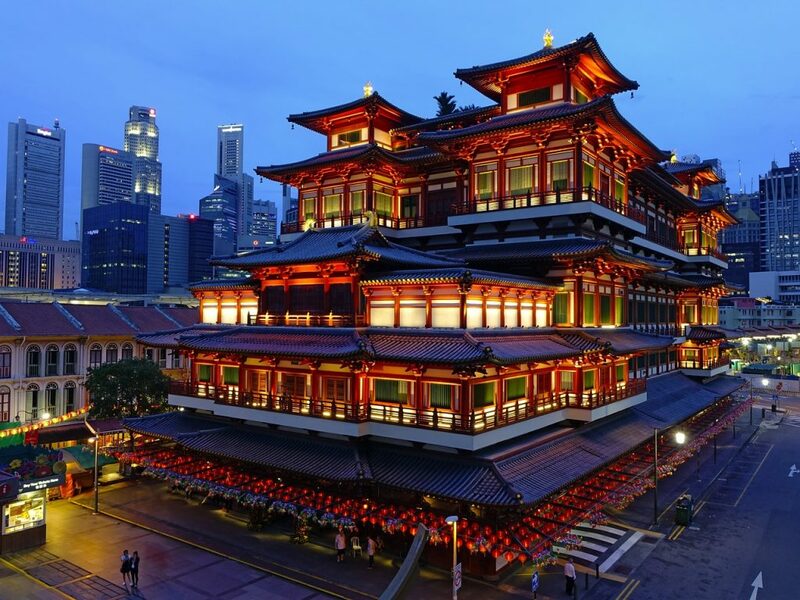 The Buddha Tooth Relic Temple is truly iconic of Chinatown. A bit overrated, in my opinion,Sentosa is a popular tourist destination if you’re interested in seeing Universal Studios. 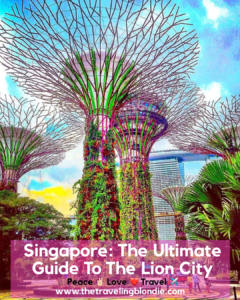 It also includes the tallest Merlion statue, the S.E.A. Aquarium, two golf courses, 2km of beach, and Resorts World Sentosa. 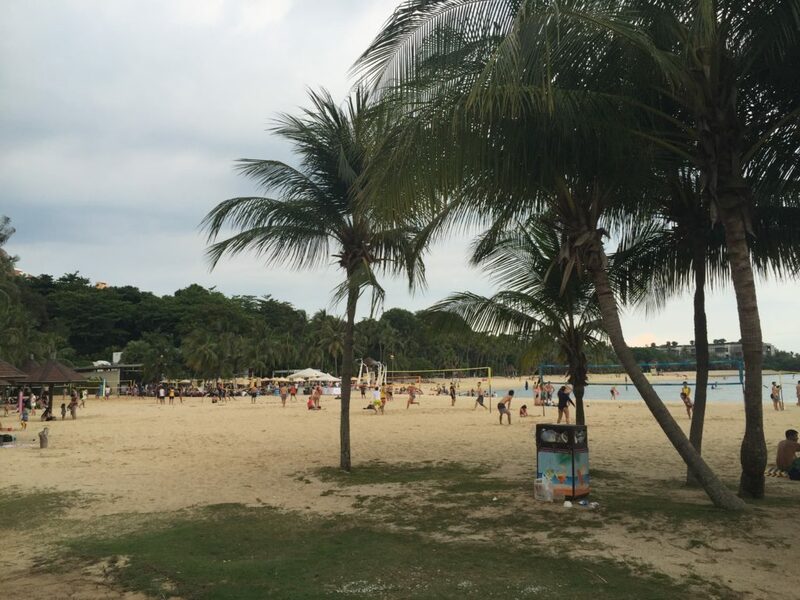 Tanjong Beach Club is a popular place to eat and have a drink. 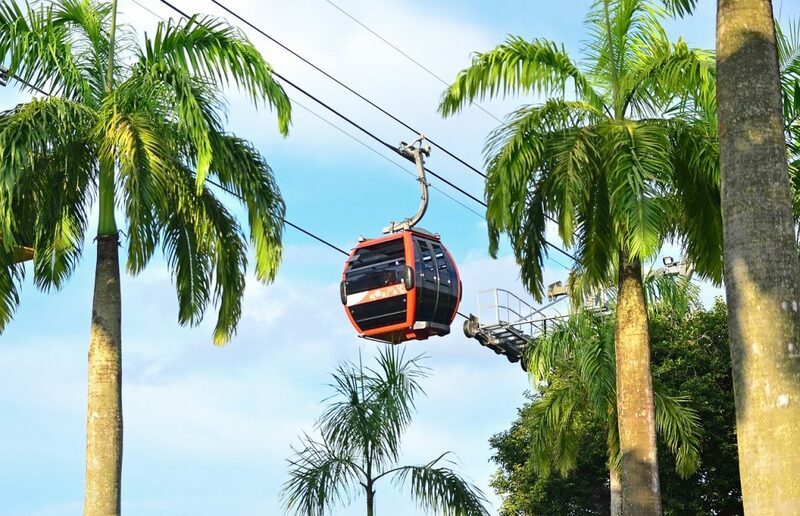 The Cable Cars are always a fun idea! Connecting Mount Fabre to Sentosa, the Mount Fabre Cable Cars are a touristy thing to do when visiting the city, but can definitely be skipped. Each cabin seats up to 8 people. Cost per ride is $29SGD roundtrip. The Singapore Night Safari at the Singapore Zoo is super famous and a main attraction amongst locals and tourists alike. I’m not a fan of zoos and don’t like to promote them, but through I’d leave this info here just in case you wanted to visit! Entry to the Night Safari is $20SG for adults and $10 for children. Zoo entry is $15SG for adults and $7.50 for children (age 3-12). They offer a park hopper combo for $28 for adults and $14 for children. 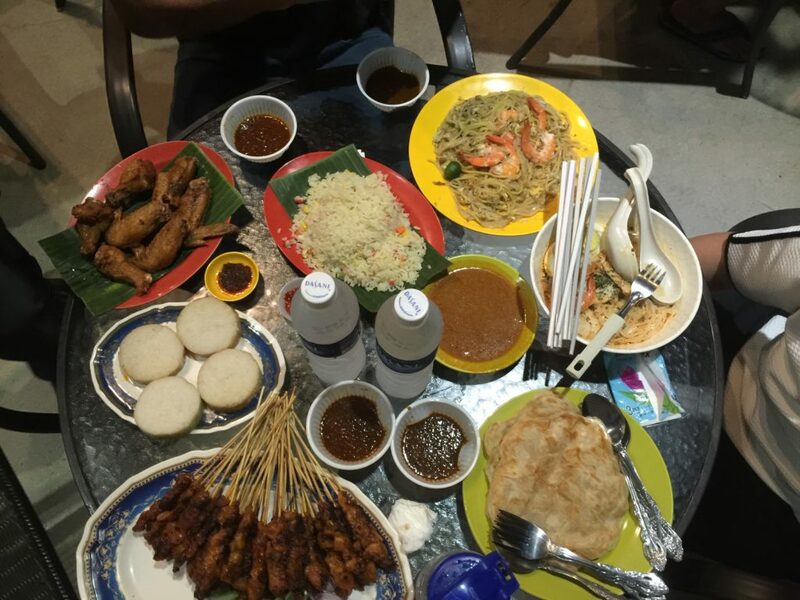 Singapore is a food lovers paradise. You can eat for $3 per person or $300! The wide range of cuisine is overwhelming, but we tried to make a list of our favorites. Cut By Wolfgang Puck is located inside the Shoppes at Marina Bay Sands. 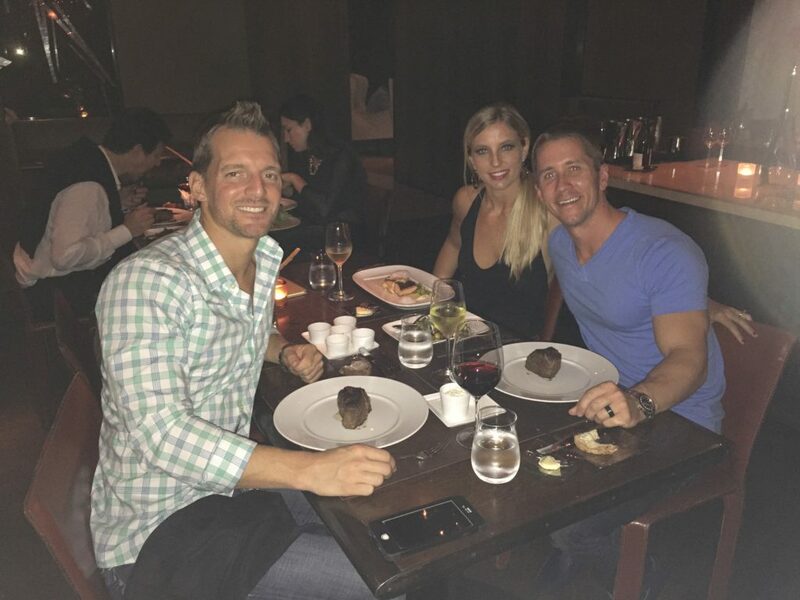 It’s one of the BEST steaks we’ve ever had, but at a very steep price. Korean BBQ At Seoul In The Regent Hotel Is SOOOO Yumm! 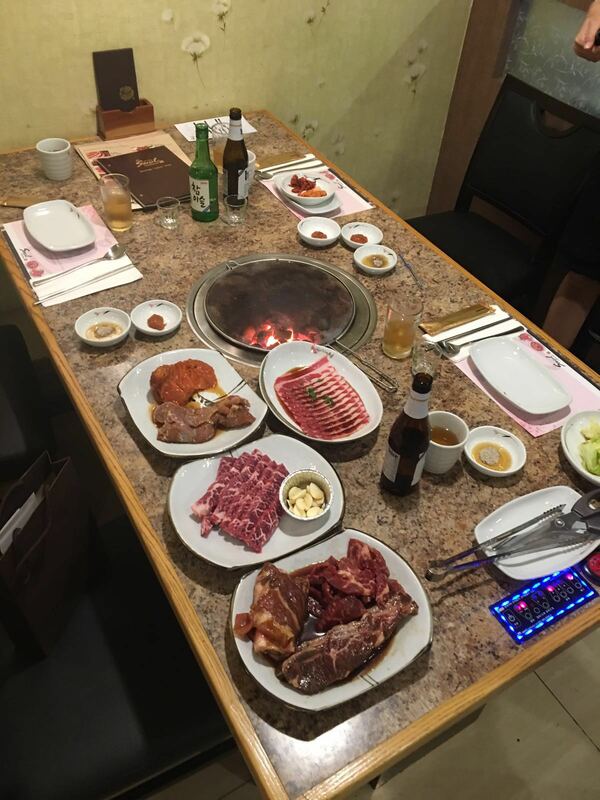 Seoul Restaurant is our favorite Korean BBQ Restaurant in Singapore! Be sure to get the all you can eat buffet at around $50USD per person. For a cheaper option, go at lunch for $30USD. Top off your meal with a mix of Soju (Korean rice wine) and Hite Beer= a delicious conception called Fok Tan Jao. Note: the atmosphere in Seoul is less than impressive, but the food and service are worth it. Bakkwa is a Chinese salty-sweet dried meat product, similar to beef jerky but a million times better. Lim Chee Guan is the best brand, located at B4 Ion Orchard. I’m still dreaming about this pizza, years later! With multiple locations all over the city (our favorite is on Martin Road), P.S. Cafe is a western food franchise that offers up great pizza, sandwiches and pasta. 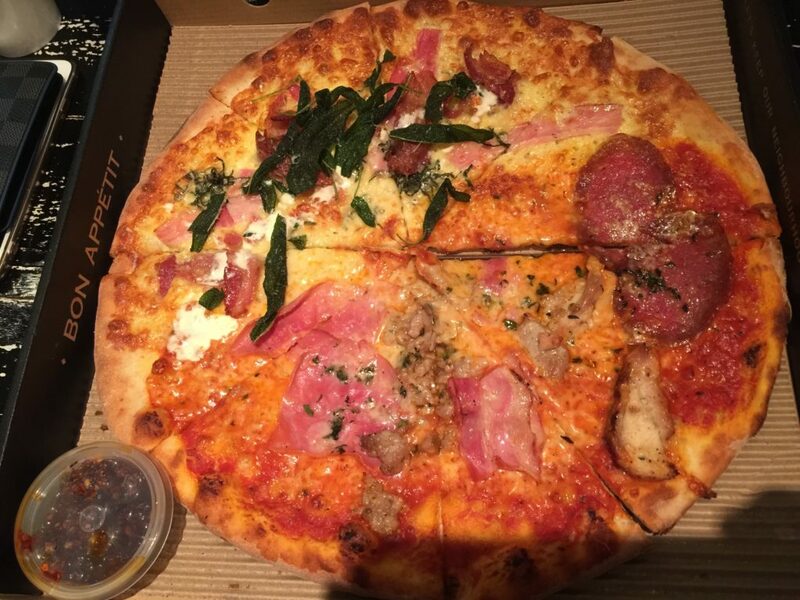 Our favorite pizza is the Waiki. I’m literally drooling as I write this! 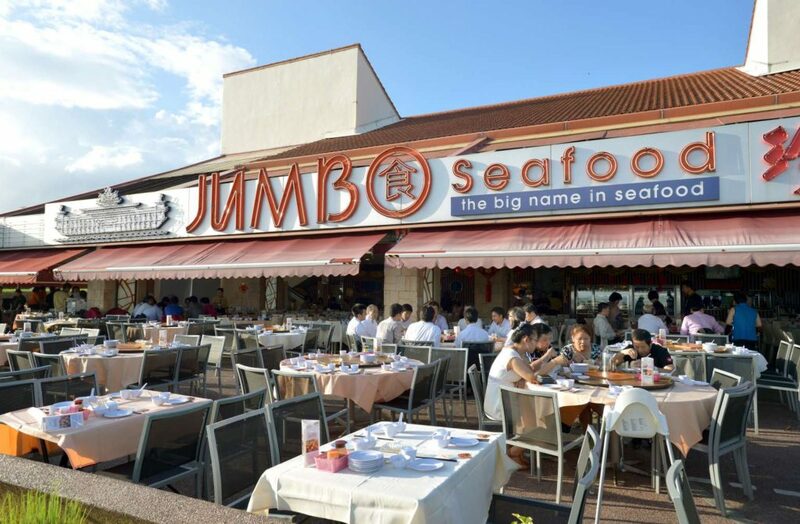 One of Singapore’s famous dishes is it’s chili crab, and Jumbo Seafood is the best and most well known restaurant to eat it at. It doesn’t get more authentic Texas BBQ then at Decker! 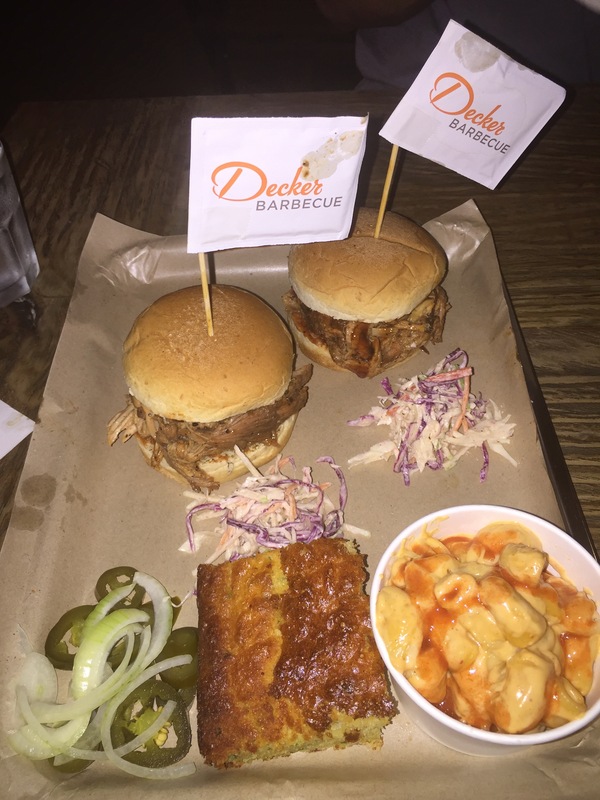 Decker BBQ has the BEST pulled pork in Singapore. They literally shipped a smoker in from Texas to make the BBQ just perfect. Get the corn bread and mac & cheese, you won’t be disappointed. 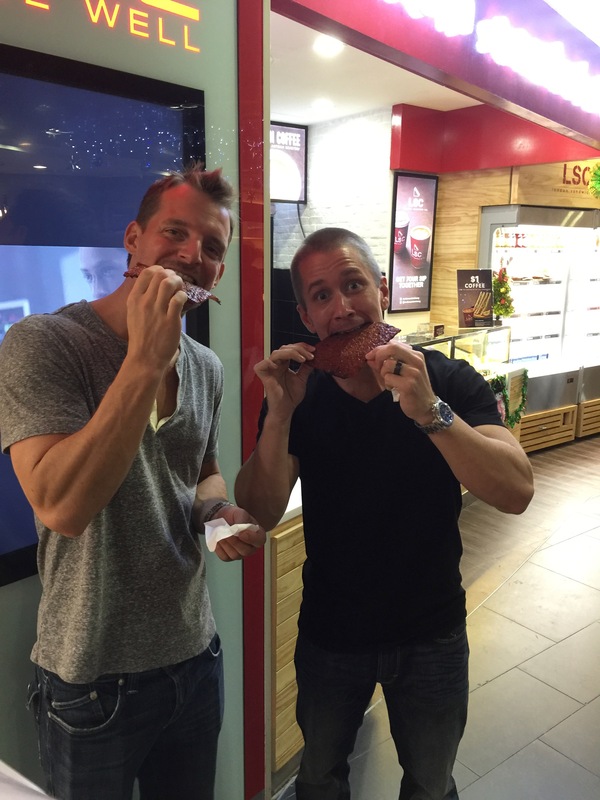 Hawker Food…a MUST MUST MUST MUST EAT! Hawker food is life in Singapore! If you follow only one of my recommendations for food, let this be the one! A Hawker Center is basically a giant outdoor food court full of delicious Singaporean food! Chicken Satay: The BEST Sinagporean dish of them all…if you like peanuts. BBQ chicken on a stick, dipped in this amazing peanut sauce. Roti Prata: a fried flour-based pancake that is cooked over a flat grill (in oil) and dipped in a curry sauce. Think of an elephant ear without the sugar dipped in a yummy curry sauce. Laksa (Katong): A heavy dish and not for everyone (especially if you don’t like fish or coconut milk). A coconut milk soup with rice noodles, prawn and fish cake. Carrot Cake: A Chinese breakfast dish. and not anything like the sweet dessert you’re thinning of- it doesn’t actually contain any carrot. Picture scrambled eggs with a Chinese twist. There are two types: white and dark-one with soy sauce and one without. BBQ’d Stingray: self explanatory…try this, its delicious! 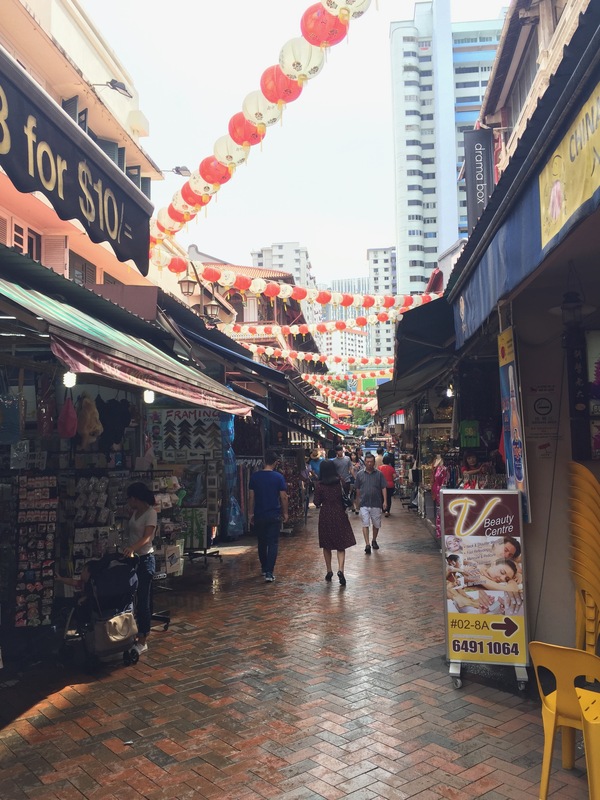 For More Info On Hawker Centers, Click Here! No visit to the great Lion City is complete without going to the ever so stylish Ce La Vi. 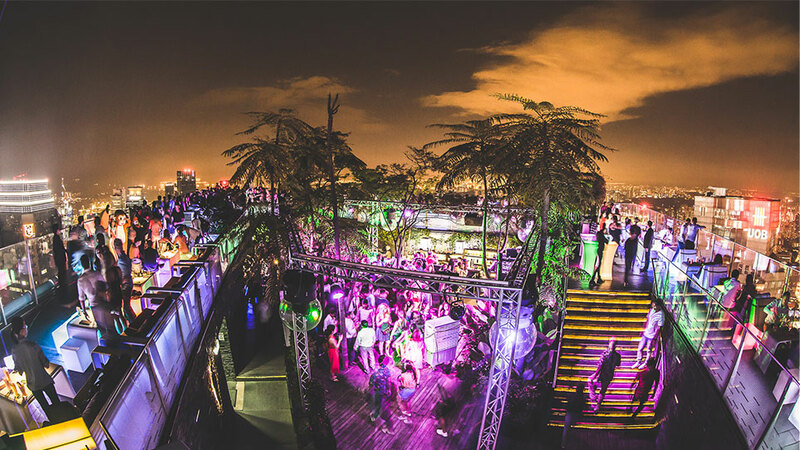 Formerly Ku De Ta (Bali and Perth’s upscale nightlife hotspot), Ce La Vie is located at the very top level of Marina Bay Sands. 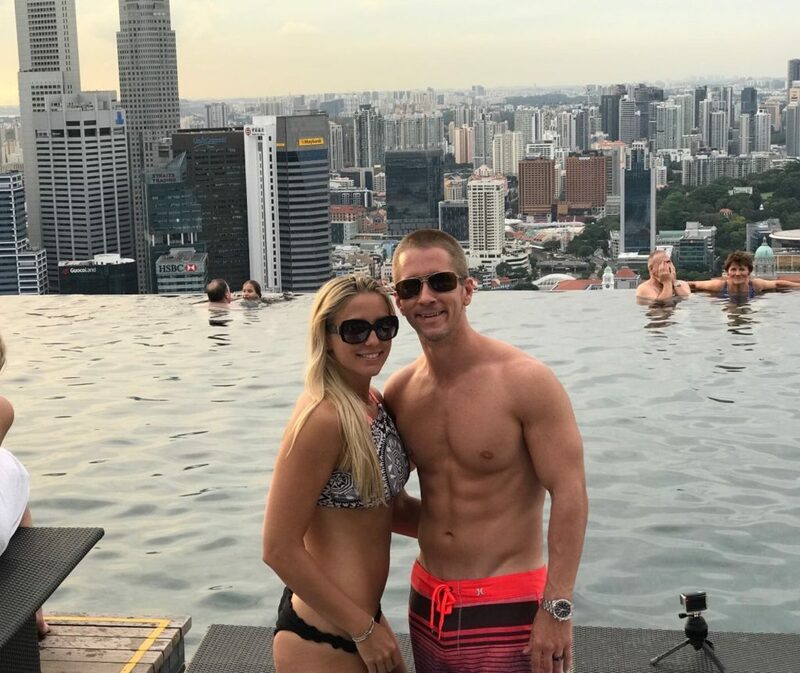 Its Skybar offers up splendid music from house DJ’s, 360-degree views of Marina Bay, succulent cocktails and beautiful people. Tip: dress it up. The elite of the elite will be strolling around here, and you’ll never know who you’ll run into. 1-Altitude is located at 1 Raffles Place. 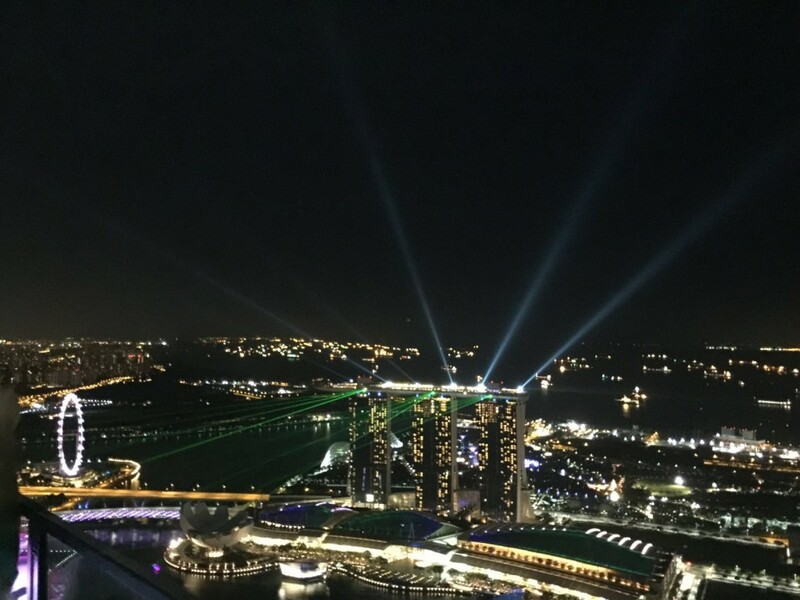 The 360-degree views of Marina Bay from the 63rd floor are epic. Do note that this is club-like atmosphere, so the music can get rather loud. 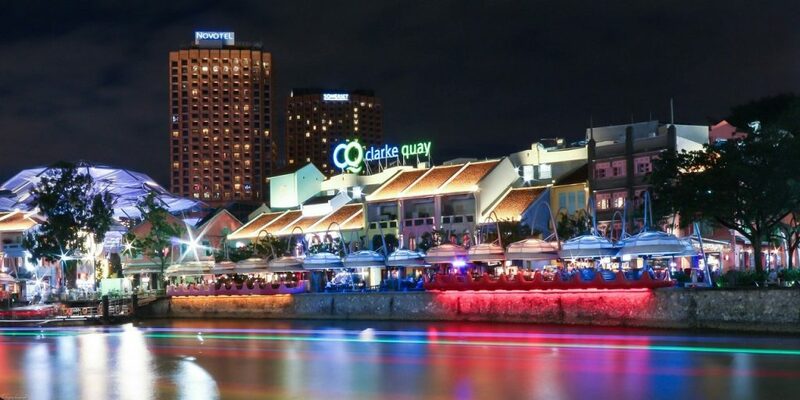 The BEST nightlife is found in Clark Quay. 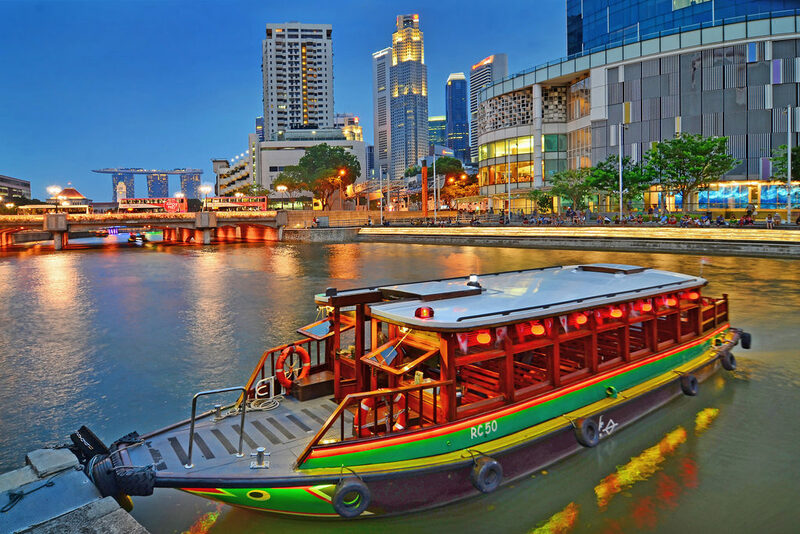 Clarke Quay: there’s nowhere else in the country where you can bar hop by the river and then jump on a water taxi to see some of the most iconic sights in Singapore from the bay. Full of colorful buildings, hip people of all ages and street performers, Clark Quay will keep one fully entertained for a night on the town! Try Brewerkz for a beer, Zouk for some house music or Cuba Libre for a margarita! 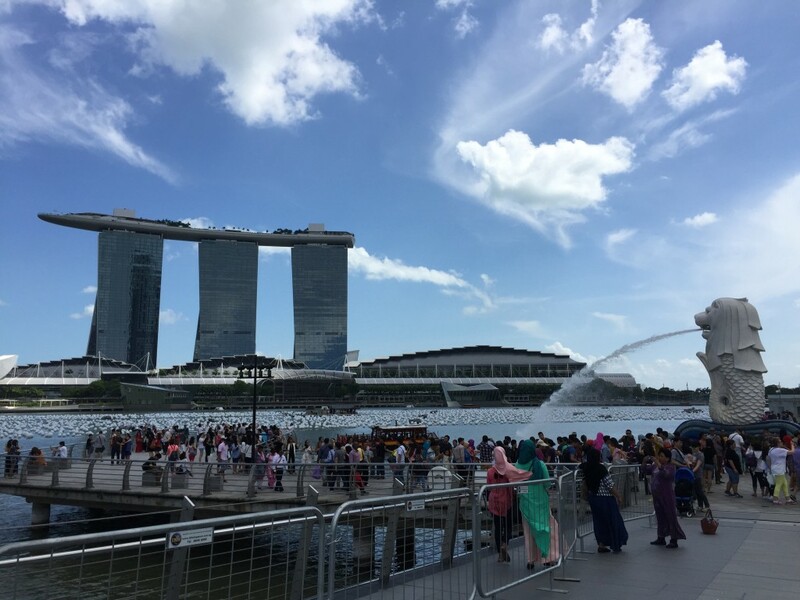 TIP: After exploring here, take the water taxi from Calark Quay to Marina Bay. With epic views of Marina Bay Sands, posh outdoor seating, and delicious house brewed draught beer,Level 33 is one of the best in town for fun on a Saturday night. 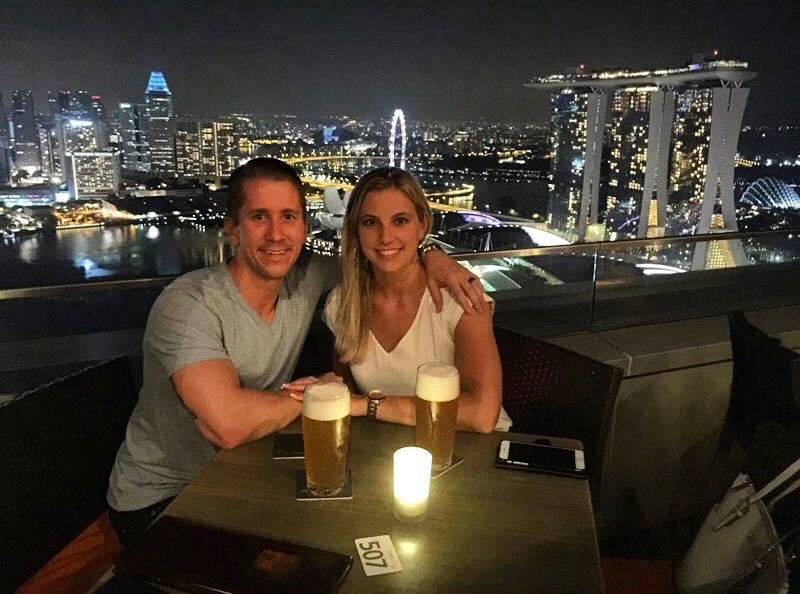 They’re the world’s highest urban craft brewery and, together with the fact that it’s located on the 33rd story of the Marina Bay Financial Center Tower, you’re sure to have an unforgettable night drinking some good brews with epic views. Tip: get there early and watch the sunset over Marina Bay…it’s unforgettable from that angle. 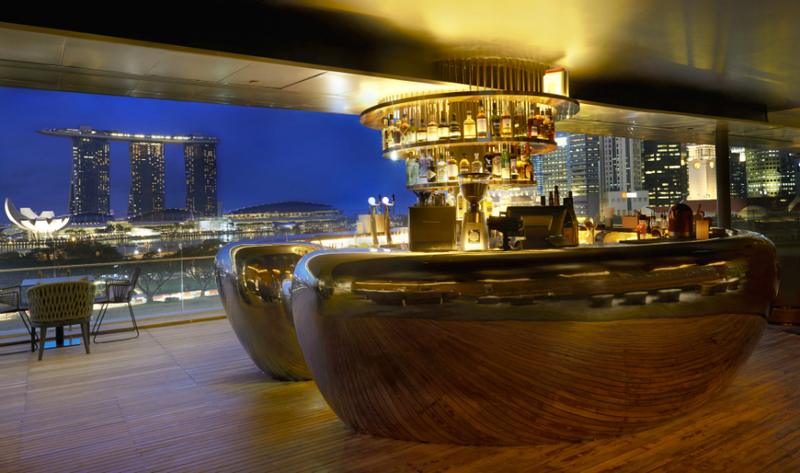 Smoke & Mirrors is a posh, sheik bar with great views of Marina Bay and an eclectic drink menu. Imagine a historical building complex that was once a Catholic convent that underwent a 50 million dollar facelift to be reincarnated into a mix of cool bars and restaurants. 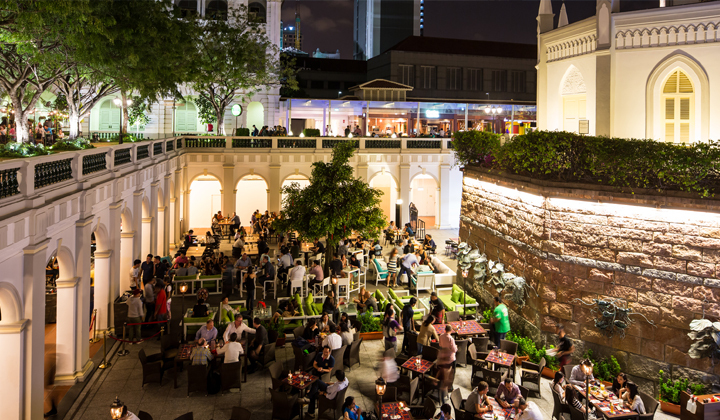 This unforgettable, 175-year-old-unique establishment is called Chijmes. Chijmes offers up over 20 different restaurants and bars to choose from, where one can kick back and enjoy the serene atmosphere. Tip: try Prive-it’s casual chic with a great happy hour. No visit to the city is complete without drinking a Singapore Sling at the outstanding historical Raffles Hotel, which was formerly the post office. This is a tough one, as most gyms in the city only allow residents to use their facilities. It’s best to get a hotel with a gym. Most yoga studios will let you pay a one-time visit/weekly pass, but that’s about it. Check out Pure Yoga at Ngee Ann City on Orcahrd Road for the elite of the elite yoga studios, or, if you’re looking for something more quaint and affordable, try out Yoga Movement, which is also located on Orchard Road. There are moneychangers EVERYWHERE in this city! 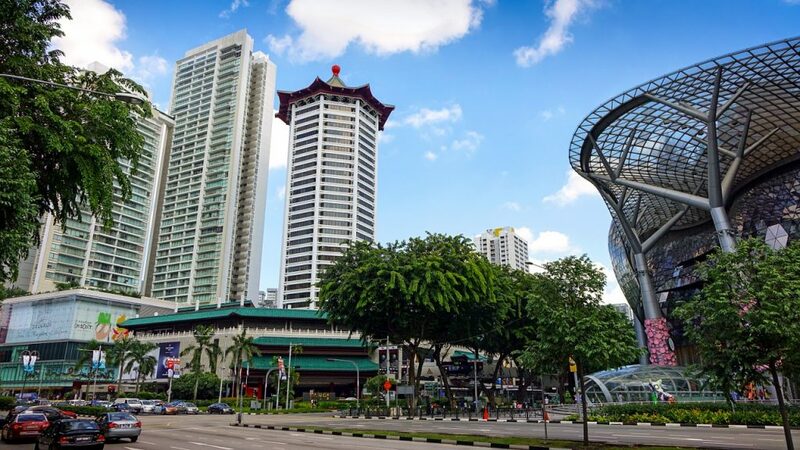 The Lion City is the second safest country in the world! Great list and I agree with most things. 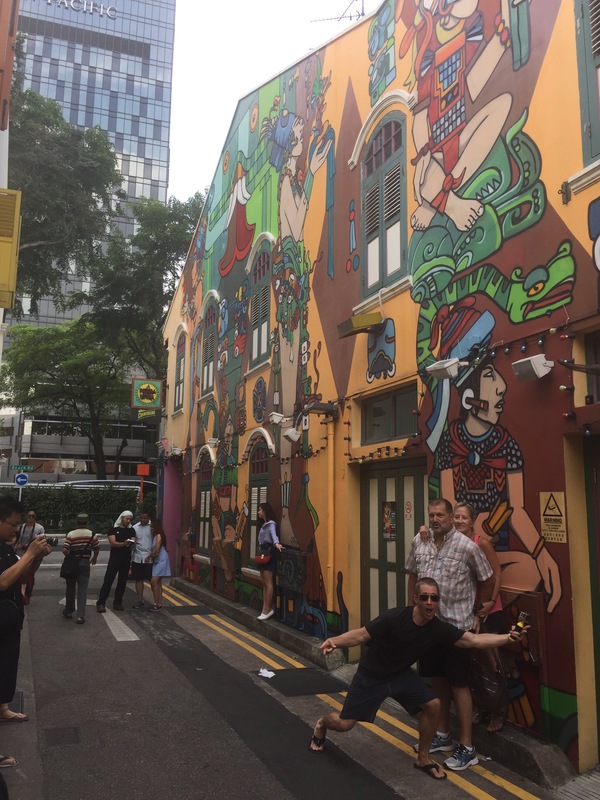 I had my adolescence in Singapore and moved back after a decade in the States for a few years. Its definitely a different country and very urban bourgeois now. Thanks for commenting! I can imagine it has changed quite a bit!